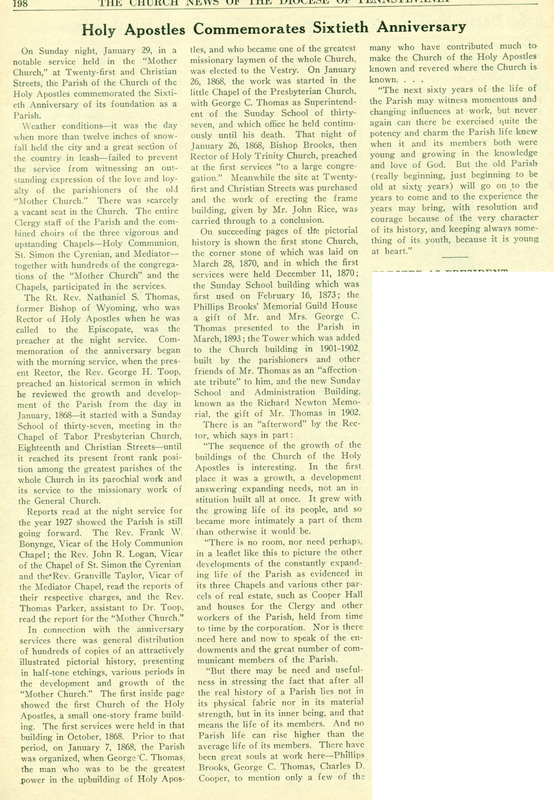 This entry was posted in Chapel of St. Simon the Cyrenian, Chapel of the Holy Communion, Chapel of the Mediator (West Philadelphia), Church of the Holy Apostles, Church of the Holy Apostles and the Mediator and tagged Church News of the Diocese of Pennsylvania, Frank W. Bonynge, George C. Thomas, George H. Toop, Graduate Hospital, Granville Taylor, Grays Ferry, John R. Logan, Nathaniel S. Thomas, Phillips Brooks, Thomas Parker on October 29, 2018 by mjk38. This entry was posted in Chapel of the Holy Communion, Church of the Holy Apostles and tagged Church News of the Diocese of Pennsylvania, Frank W. Bonynge, Point Breeze, South Philadelphia on November 28, 2016 by mjk38. From the Archives of the Diocese of Pennsylvania. Click on the image to access the booklet. This entry was posted in Chapel of the Holy Communion, Church of the Holy Apostles and tagged Archives of the Diocese of Pennsylvania, Frank W. Bonynge, George C. Thomas, Point Breeze, South Philadelphia on September 20, 2016 by mjk38. 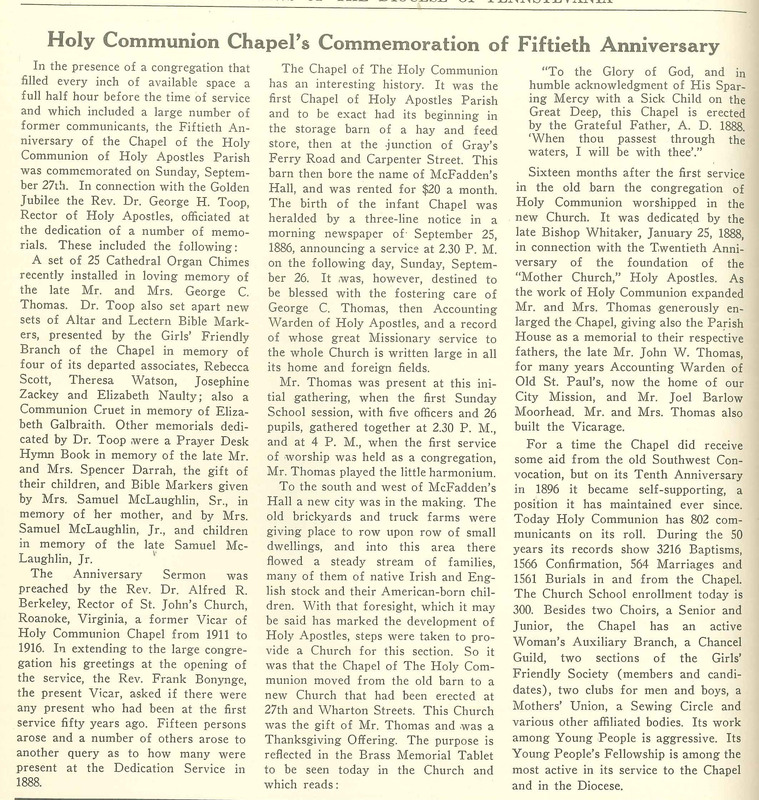 This entry was posted in Chapel of St. Simon the Cyrenian, Chapel of the Holy Communion, Chapel of the Mediator (West Philadelphia), Church of the Holy Apostles, St. Simon the Cyrenian Church and tagged Church News of the Diocese of Pennsylvania, Frank W. Bonynge, George H. Toop, Graduate Hospital, Granville Taylor, John R. Logan, South Philadelphia on February 28, 2015 by mjk38. This entry was posted in Chapel of St. Simon the Cyrenian, Chapel of the Holy Communion, Church of the Holy Apostles, Church of the Holy Apostles and the Mediator and tagged Alfred R. Berkeley, Charles D. Cooper, Frank W. Bonynge, Frederick C. Price, George C. Thomas, George H. Toop, Granville Taylor, Grays Ferry, Henry McKnight Moore, Henry S. Getz, Herbert L. Hannah, John H. A. Bomberger, John R. Logan, Nathaniel S. Thomas, Philips Endicott Osgood, Phillips Brooks, Point Breeze, Richard N. Thomas, Robert M. Baur, Samuel Hamill Wood, South Philadelphia, Thomas D. Parker, Thomas G. Brown, West Philadelphia, William F. Ayer, William Oscar Roome Jr., William P. Remington, William S. Neill, William T. Capers, Wilson R. Stearly on February 24, 2015 by mjk38.